Today is a sad day… Bob Mackie passes away. We will miss you. Today is a sad day for the Ontario Landowners Association. On February 8, 2014 at about 4 a.m. Bob Mackie passed away in hospital from complications associated with an ongoing heart condition. Many will know Bob as one of the governors of the OLA, the current president of the Niagara Landowners Association and member of the group since it was founded. 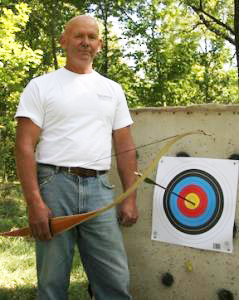 He was the owner of Mackie’s Mountain Archery, a shooting range that was enjoyed by enthusiats of all ages and which also used archery as a form of therapy for people with brain injuries. His range came under fire from the Niagara Escarpment Commission (NEC) when a neighbour laid a complaint and the NEC claimed that their rules on land use designation would not allow Mr. Mackie’s agricultural land to be used for archery. Bob and his neighbours rallied together to form the Niagara Landowners Association and joined the OLA. Through many years of going to court and back for appeals, Bob refused to bend to the whims of this self serving commission that has tried to take over control of private property, when its mandate is only for land that it possesses or has made an agreement on. It destroyed his business and ordered it closed but Bob’s answer was “do your worst. I am not stopping or leaving”. In the end, they may have killed him but they did not beat him, because like every fight for freedom, he has become another casualty on the way to victory and he gave his life to that battle with no fear of the consequence to his own health. We are truly left with that terrible emptiness of losing a brother, a trusted friend and a man with a true passion for life and a great sense of humour. We miss you Bob and our thoughts are with Yvette, Starr, your family and friends. Visitation – Monday Feb. 10, 2014 – 6:30 p.m. to 8:30 p.m.
Funeral – Tuesday Feb. 11, 2014 – 1 p.m.